When you learn Spanish and you hear the term, “reflexive verbs,” what comes to mind? Do you immediately think of an example of a reflexive verb? Or does the term fill you with dread because you'd really rather not think about the rules of grammar…in any language? No matter how you react when you hear the term—or if you have no idea what it even means—there's no need to panic. You've probably been using these verbs already, especially if you've made it to an intermediate level of Spanish. Reflexive verbs are such a big part of everyday Spanish that chances are good you know some already…even if you don't know exactly why they work that way. You might not have many issues using them. But you probably have questions, especially when it comes to new verbs or more complicated sentences. What are some common reflexive verbs in Spanish? How do I know when a reflexive verb is really needed? Where do I place reflexive pronouns? What do I need to know to fully master reflexive verbs? 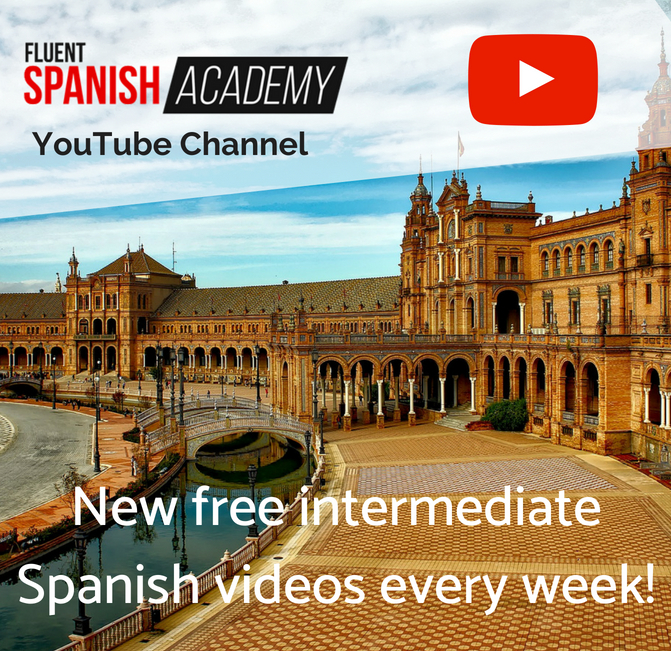 You can find the answers to many of these questions in my Fluent Spanish Academy video all about reflexive verbs in Spanish, or you can scroll down to read more. By the end of this post, you'll know everything you need to use Spanish reflexive verbs fluently and confidently. #1 What Are Spanish Reflexive Verbs And How Do You Use Them? Before jumping into Spanish reflexive verbs, let's take a step back and review a few parts of speech so this article will make total sense. Verbs are words that express action. In Spanish, they end in –ar, –ir, or –er before being conjugated to match the subject. The subject of a sentence is the person, place, or thing that is doing something. Identifying the subject is especially important in Spanish because the verb conjugation will change depending on the subject. Maria tiene que ir a la escuela hoy. Ella se olvidó sus libros en el aula. Those three parts of speech are all you need to know to understand reflexive verbs. As for Spanish reflexive verbs, they're a special type of verb that direct back to the subject. Note that se can function as a second- or third-person pronoun (usted or él/ella) as well as a singular or plural pronoun (usted/ustedes or ellos/ellas). In this example, both the verb conjugation (fuimos) and the reflexive pronoun (nos) match the subject (we). That's why it's so important to know exactly what the subject is in any given sentence. Some reflexive verbs are always reflexive, while others have both reflexive and non-reflexive forms, which I'll talk about next. 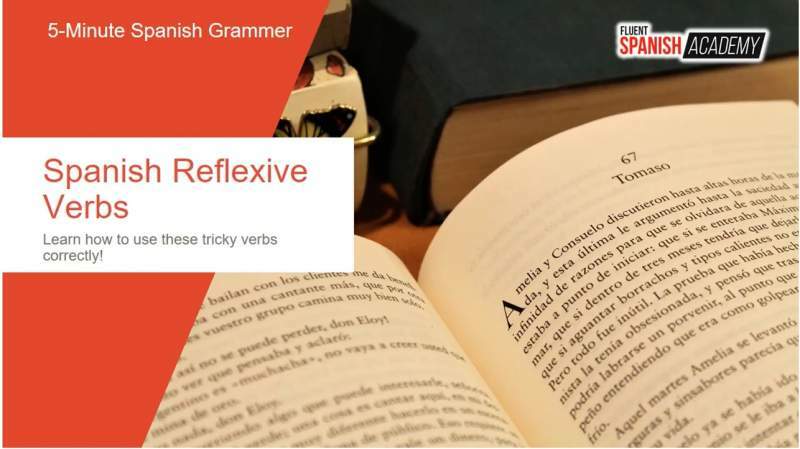 There are five basic categories of reflexive verbs: routines, motion, emotions, reciprocals, and verbs that are always reflexive. Routines: These are verbs that describe daily routines, usually surrounding getting up and ready each day, such as despertarse, peinarse, and levantarse. Motion: Some verbs, such as irse, describe motion or movement. Emotions: Many emotions use reflexive forms, including aburrirse, preocuparse, and crearse. Reciprocals are only reflexive in their plural forms, meaning two or more people are doing something together or to each other, like in the case of casarse or encontrarse. Always reflexive: A small number of Spanish verbs are always reflexive, including quejarse de (to complain about), darse cuenta de (to realize), and arrepentirse (to repent). Whether or not a verb is reflexive changes the meaning of the sentence. So it's a good idea to know whether you want the reflexive form or not. The subject is “I”, so the reflexive verb is conjugated in the first person (desperté). I am waking up myself, so the reflexive pronoun is me. Desperté a los niños a las ocho. (I woke up the kids at 8). The verb is still conjugated in the first person because I am still the subject of the sentence. In this case, however, the verb is no longer reflecting back to the subject, so I don't use the reflexive form. 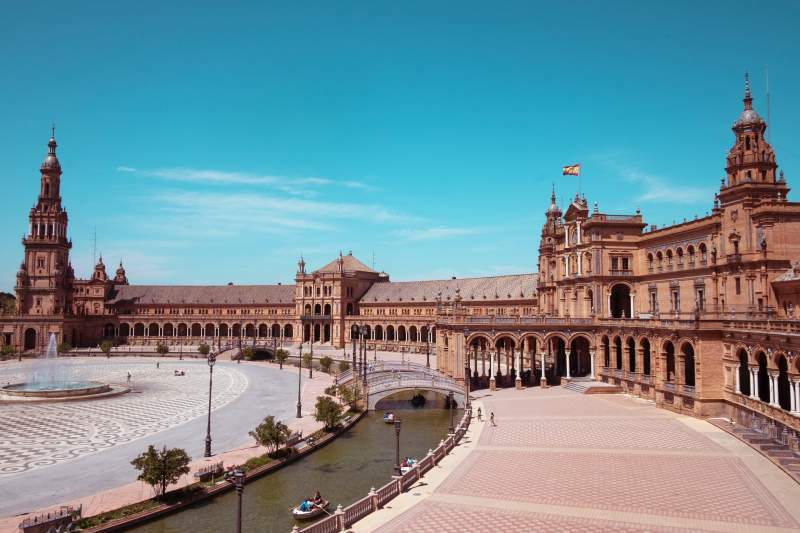 #4 Where Do You Place Spanish Reflexive Pronouns? In the examples above, the reflexive pronouns were all placed directly in front of the reflexive verb. This is the common and correct placement in many situations, but not all. In reality, you have two options for pronoun placement. Reflexive pronouns come before the verb, compound tense, or construction in all tenses or moods except affirmative commands. With the infinitive: Vamos a casarnos. (We're going to get married). 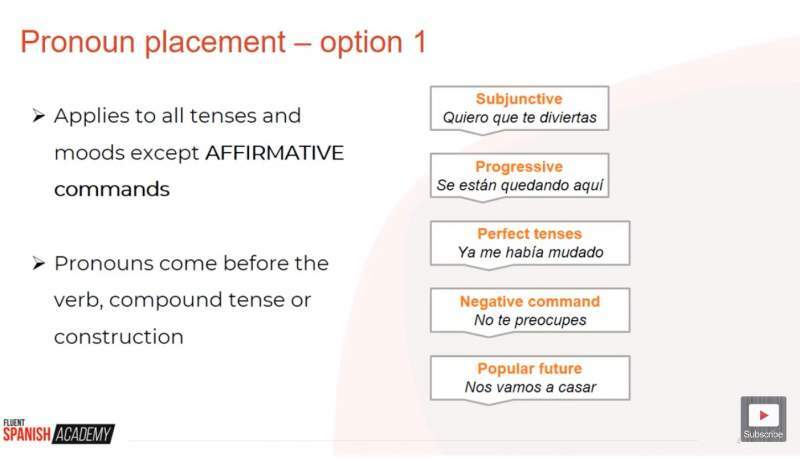 You probably noticed that the last two examples, the gerund and infinitive, are variations of similar sentences from Option 1. 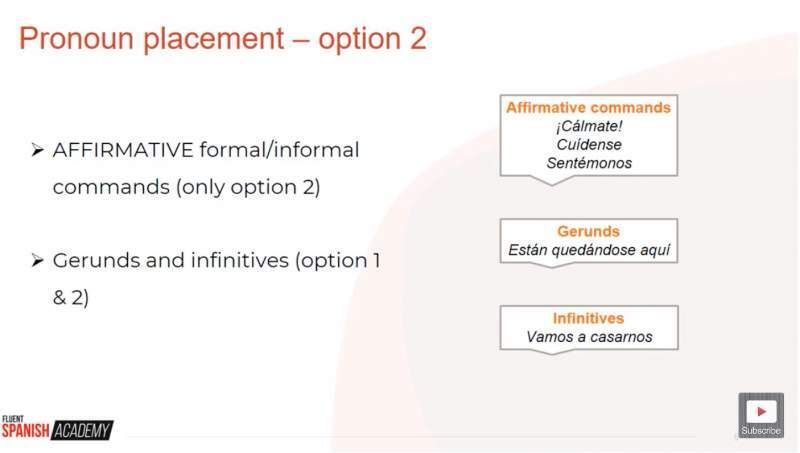 That's because with gerunds and infinitives, you can choose between either placement option. 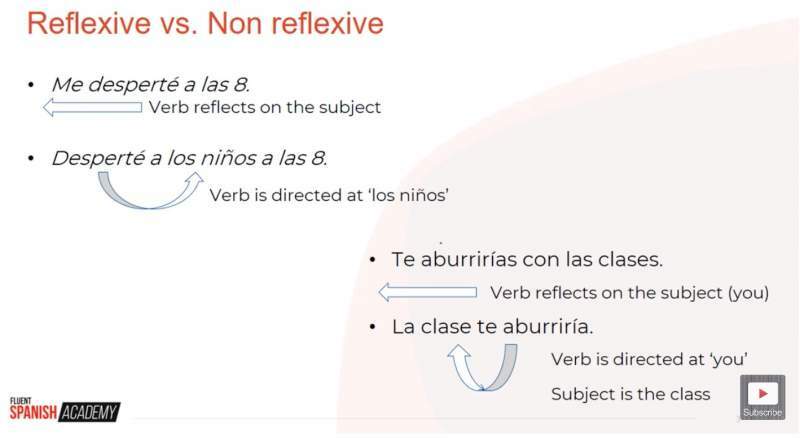 The key to truly mastering reflexive verbs in Spanish is to know the difference between reflexive and non-reflexive versions of the same verb. In this example, the boredom reflects back on you. You are getting bored, so the reflexive verb (aburrirse) is appropriate here. In this example, the class is the subject and a pronoun isn't needed to reflect back to the subject at all. In the case of acordar and acordarse, the meaning changes completely whether or not you use the reflexive form of the verb. Acordar means to agree. Acordarse, on the other hand, means to remember. In Spanish, many verbs are more literal than in English. Nos encontramos literally means “to find each other”, whereas in English we would say “we met up” instead. 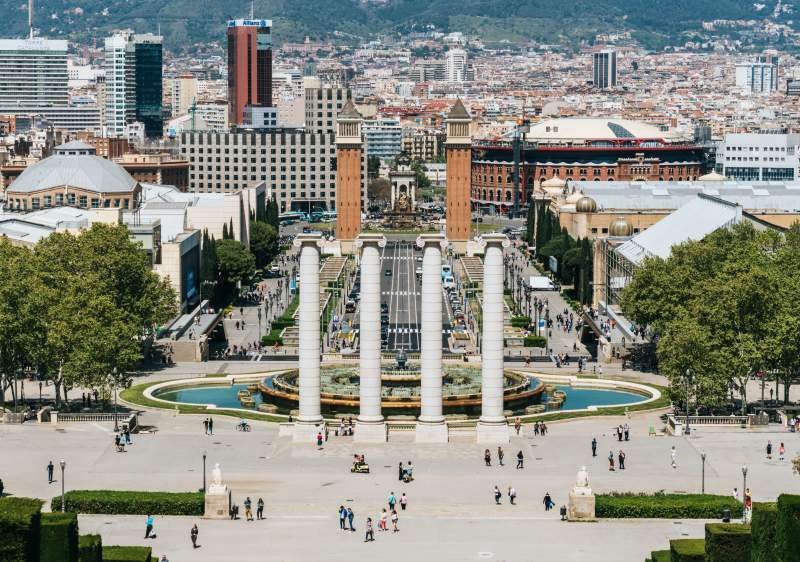 Many of these distinctions come with practice and exposure to plenty of authentic Spanish conversations. 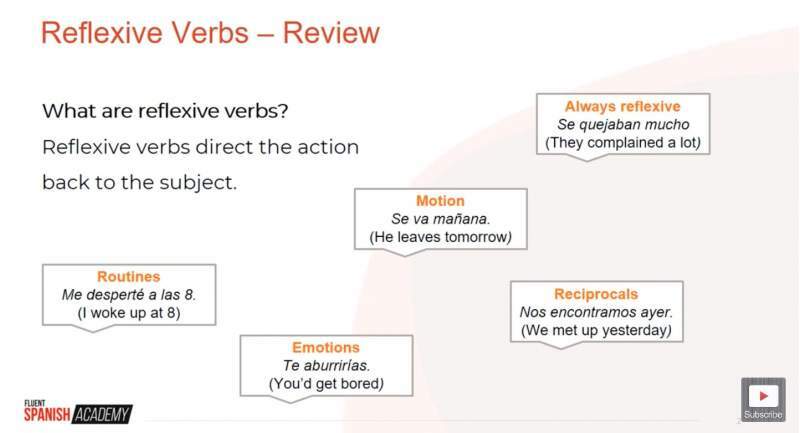 So in addition to revising the rules for using reflexive verbs in Spanish, be sure to get plenty of exposure to authentic Spanish through reading, listening to, and speaking Spanish every single day. You'll soon be able to pick out reflexive verbs in real time. They will become second nature to you, and you'll be able to use and understand them without having to think about it beforehand. After reading this article, do you feel more confident about using and understanding Spanish reflexive verbs? Which other aspects of Spanish grammar do you find tricky? Share your thoughts in the comments below.